Landlocked by the four hills of Harihar, Pushpadri, Brahmadri and Harishnachal, the town of Harihareshwar is situated in the Raigad district of Mumbai. This town is referred to as Devghar which translates to "House of God", since northern part of the town houses a temple dedicated to Lord Shiva. 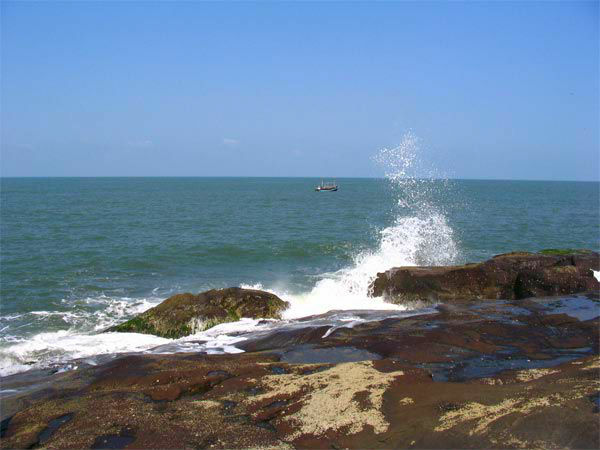 The town is the place where river Savithri merges with the majestic Arabian Sea. It is located just about 200 km from Mumbai and 170 km from Pune. The Western Ghats standing tall in the backdrop, while resting in the tranquil beach is an experience that can only be felt best! The Harihareshwar beach, along with Diveagar and Shrivardhan beaches of the Konkan Coast, makes for a relaxed and peaceful weekend getaway. The months of October to March is the ideal time to visit the town of Harihareshwar. The climate will be breezy, cool and pleasant. If you want an experience of Harihareshwar's celebrations of Ganesh Chaturthi, then September is the month to visit. This simple route from Mumbai to Harihareshwar takes about 4 h 30 mins with normal traffic, and covers a distance of 202 kms. The planned township of Navi Mumbai, which plays as an extension of Mumbai, is located at a distance of 22 km. With a whopping 2 million population, Navi Mumbai has quite a few places of interest that is usually visited by both locals and tourists. Navi Mumbai has a number of suburbs like Mahape, Nerul, Vashi, etc. These suburbs have places like the Pandavkada Falls, Parsik Hill, and Wonders Park, which are some of the must-visit places here. The small town of Durshet is located about 55 km from Navi Mumbai. Nestled on the banks of River Amba, it is a place of significance because it played as the war-field during the reign of Chhatrapati Shivaji Maharaj. The two forts that came under the reign of Shivaji Maharaj in Durshet is the Sudhagad and Sarasgad, which are now popular trekking destinations. Regular trekking clubs from Mumbai and Pune, plan a trek to these forts. Kolad is a picturesque village that is covered with lush green throughout the region. This peaceful village plays host to the River Kundalika, the place where white water river rafting is conducted. When the currents are in full speed, river rafting will be conducted over an area of 12 km. So if you're an adventure freak, you know where to stop! Local services provide good facilities and deals on river rafting here at Kolad. Read further about the places to visit in and around Harihareshwar. Harihareshwar Beach, the highlight of this small town, is a clean, tranquil and offbeat destination. The main factor attracting tourists to this beach are the clean waves hitting the rocky shores of this relatively deserted beach. The beach is lined with a number of small shops and quaint resorts where you may book your stay while visiting the town. Harihareshwar Beach offers some exciting water sports facilities like Kayaking, Banana boat riding, speed boating, etc. Even the Diveagar Beach, which is located just a few kms from here, offers activities like Paragliding or Parasailing all for a steal! Since these destinations are offbeat, water sports and other activities can be availed for relatively cheap prices. Many local stalls offer these sports to the visitors. With a beautiful view of the serene beach, Harihareshwar temple complex is settled right along the shores of the beach. It has two temples, one dedicated to Lord Kalbhairav and the other to Lord Shiva. Devotees from all over the country visit this temple. Lord Kalbhairav is, in fact, a manifestation of Lord Shiva. These temples were built back in the 16th century, therefore the Shivlinga in Lord Shiva's temple is quite ancient! Cuddled between two mountains, like the name suggests, Ganesh Gully is a narrow passage which leads to the idol of Lord Ganesh. It is a 3 feet wide passage, that leads to a place that is believed to be sacred and is a popular spiritual niche. The idol is mostly submerged in the sea water, for almost 30 ft. But during low tides, the idol surfaces when it can be viewed clearly. The ancient town of Shrivardhan used to be under the reign of the royal Peshwa Dynasty. A statue of Peshwa Balaji Vishwanath stands tall in the town in the honour of the great ruler. The Shrivardhan Beach can be found only a few kilometres away from Harihareshwar. The glittering sand clear blue waters of Shrivardhan Beach is also quite unexplored. View of the sunset and sunrise is simply spectacular from this beach.